The Biddeford show demonstrates the art form's many uses. Curated by Deb Whitney at Engine in Biddeford, “Drawing I: The Every Day” takes drawing far past our well-worn expectations to places where the possible meets the exceptional. The show features work by local and international artists: Judith Allen-Efstathiou, Melinda Barnes, Terrance Brett, Tanja Kunz, Brian Lynch, Paul Ridyard, Nicola Saunderson, Alex Sax, Sabrina Small and Whitney. 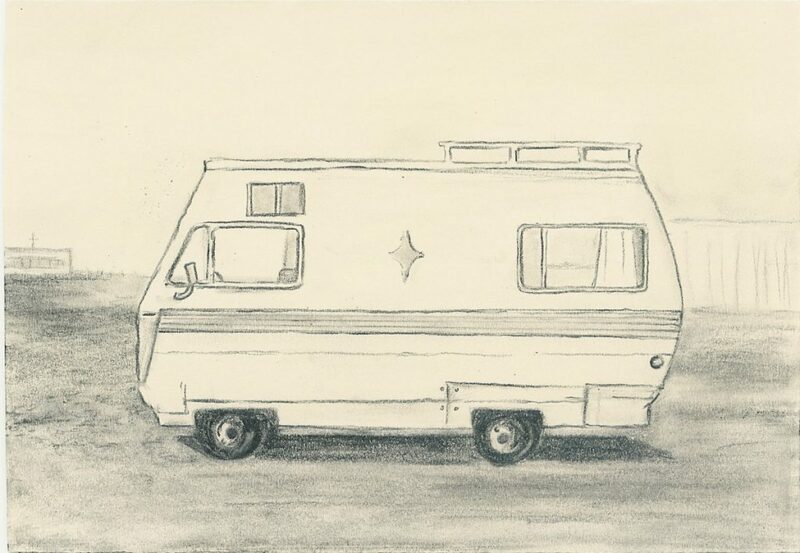 Melinda Barnes, “Camper,” graphite on paper, 2011. Whitney was the director of the erstwhile Portland gallery Whitney Art Works and has extensive experience as a curator and artist. 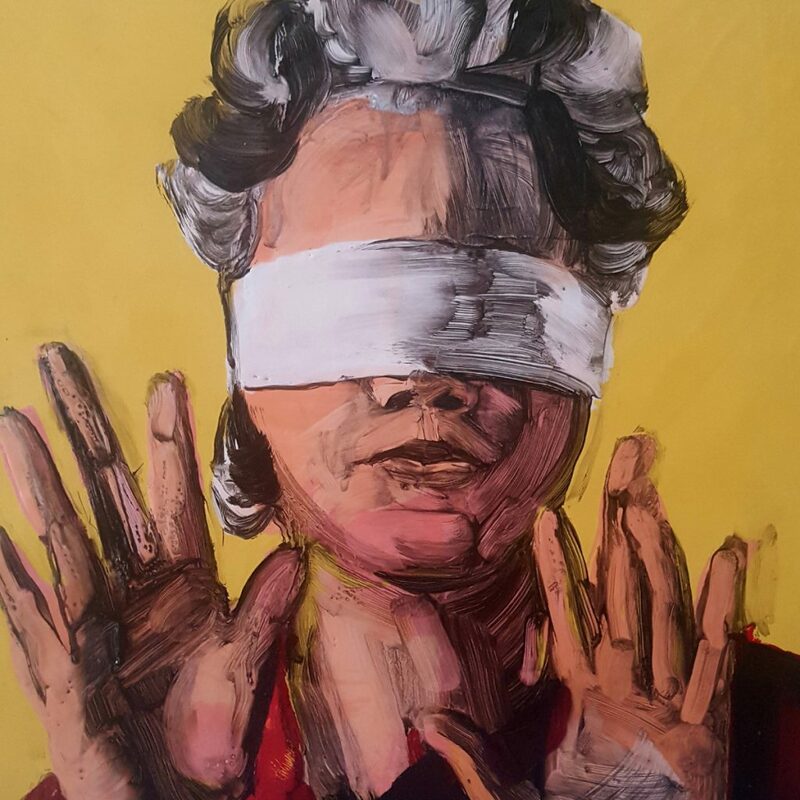 Her own work in the show, four square encaustic and oil panels depicting women in traditional portrait formats, sets the stage for the edginess of the exhibition. Whitney’s images use color broadly as a tonal setting for the depictions rendered as brush drawings in black oil. The conceptual thrust of these works is not to depict the identifiable individuality of each woman, but to display with rhetorical clarity the emotional state of each figure. The effect is therefore something like emotional flashcards, a primer, if you will, for empathy. In the context of current events such as the Kavanaugh hearings and the president’s now infamous lack of empathy – particularly towards women – these pieces ring with a silver-toned poignancy. Paul Ridyard, “Maine,” graphite on paper, mounted on panel, 2017. Nonetheless, it would be easy to read Whitney’s work along the seams between painting and drawing, rather than as the outer edge of political content in “Drawing I.” Sax’s scads of butterflies, each drawn differently on a uniform paper shape and suspended in space, relate to the Holocaust, but their feel is more meditative or spiritual than political. The rest of the work is more internally conceptual. Allen-Efstathiou’s long, suspended roll, “Binary is Best,” pits floral decoration on one side against decorative drawing with binary “0s” and “1s” on the other. 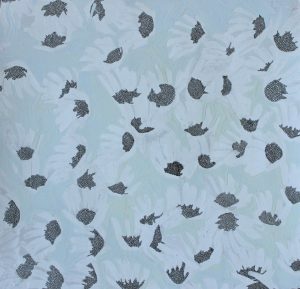 It’s a savvy play; rather than heavy-handedness about the evils of the digital age, the artist hints at the importance of the role of decoration in meaningful aesthetics, as well as the mathematical logic of flora. 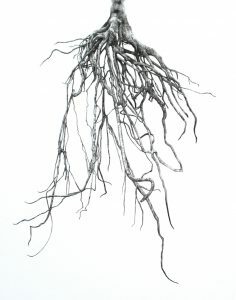 London artist Ridyard is represented by a piece titled “Maine,” a high-focus literal drawing of a root system that flows down into the plain white space of the paper. Its placement, hanging behind Allen-Efstathiou’s work, plays up the related and (very) brainy side of both their content. 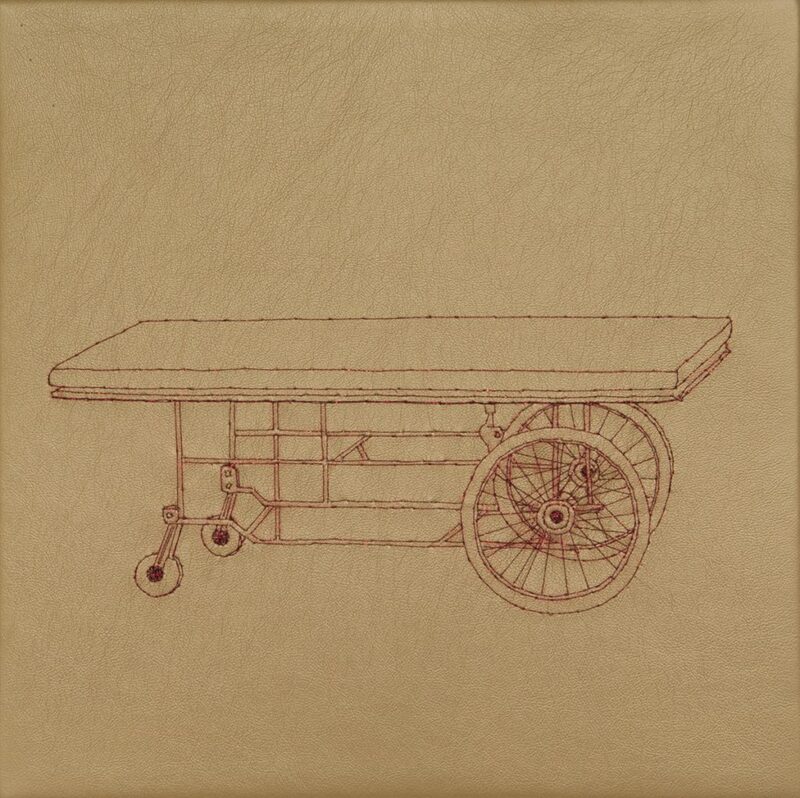 Sabrina Small, “Gurney,” hand stitching on gold vinyl, 2013. Barnes’ drawings of everyday objects are tiny but hugely charming. Her “Camper” – an old RV in profile – in particular plays up the adorableness of the vehicle’s design with childlike freshness. Lynch’s varied drawings range from a conceptually witty light switch to figures that engage through their brush-rendered simplicity, particularly his two works featuring coated male figures seen from the back, hunched as though from unseen rain. Deb Whitney, portrait, oil paint, vegetable oil on carnauba wax, 2018. Brett’s “drawing” is a pair of doors (well, actually, one door seen from both sides) cast in latex. The drawing-ness of the work is as gorgeous as it is hilariously brilliant: Brett plays up the seams and distressed textures with a bit of color. This is a sculptural object, but by being forced to consider it as a 2-D pairing against a wall (it looks like a fake double-door) we have to consider it as 2-D art, and it ain’t no painting. Besides, drawing reigns over the realm of ideas. Architects, scientists, soldiers and engineers all map their ideas with drawings. Painting can do a lot of things, but drawing, more than painting, is about the legibility of ideas. And this is one of the reasons why contemporary art and conceptualism is so much more comfortable with drawing than painting. Tanja Kunz, work on paper. English artist Saunderson’s works are watercolors in the tradition of architecture. Her image of structural columns under a bridge is something of an architectural fantasy in which she finds classical rhythms among these workaday functional objects. Instead of dirty concrete, she sees Atlas. Small’s hand-stitched drawings on gold vinyl play up the cold creepiness of the anaesthetic clarity of illustration, particularly her images of empty prosthetics. Her “Gurney” might be the strongest piece in the show. “Drawing I” is an excellent marker for the welcome return of Whitney from her London sojourn. She is a remarkable curatorial talent, and with her guiding hand, Engine has mounted a most worthy exhibition.